Continuing our recent run of form, this year’s Bedford Fours and Eights Head saw us take home three wins from the seven boats entered, a very good return. The other crews posted good times against stiff opposition, largely from the college and school crews who were out in strength. The event itself seems to go from strength to strength and attracted a record entry this year – the downside to this was, as we were a bit later in submitting entries, we wound up being there from Division 1 to Division 7. Still, this meant we were still around to pick up pots! Second outing for the Men’s Eight this year, with Gwen swapping in for Steve (compared to Northampton). Although a bit rough in parts, there were patches where we got the boat running well and there’s obviously real power in there. Helped by not having my seat collapse, we put out a time of 7:11 to put us level with Bedford RC with only Broxbourne beating us in the club crews. Third win in a row for the Ladies, with Paula, Lou, Karen and Clare (coxed by Steve) putting down a time of 8:29, over half a minute ahead of their rivals from Bedford RC. A good, fast race by Andi, Ash, Liz and Sam saw them across the line in 7:50, some 43 seconds clear of their competition, from Exeter Uni, giving them another win. Our usual crew of Pierre-Yves, Simon, me and Steve actually posted the fastest Masters Quad time of the day, at 7:23, but lost out on handicapping to Masters D boats from Star Club and Oundle, by 4 and 5 seconds respectively. What started out as a “fun” entry turned into a very respectable boat, not only winning the category but setting the fastest MK time of the day. Also a first marital double for Andi and Tim, with Josh and Liz (rowing for a change!) completing the crew. Unusually for Bedford, the weather wasn’t perfect (maybe the sacrifices weren’t up to standard?) but despite this another thoroughly enjoyable day’s racing. I do love the way they keep to time, chivvying crews along and taking no nonsense but always good naturedly. Being there all day did make it a long day (watching the crews for the last division trying to get motivated after an hour in the club house was quite amusing) but did allow us to be there to collect the well earned pots. Must put in a special mention here for Liz – not only did she win two pots but spent the rest of the day coxing. In particular, the way she spun our eight at the start was simply jaw dropping – there can’t have been more than three feet spare at either end as she manoeuvred the boat, spinning it on the spot. Sheer class, totally impressed. Also thanks to the wonderful lady at Bedford RC, who’s birthday it was, who kindly fed the gannets from MK the food left from her party. It was hugely appreciated. Finally, octuples… I know they have to learn and take part in races but I do feel there should be a restriction on putting little kids in charge of little kids. Clearly, some of the crews were barely capable of sculling and having a young child attempting to steer them is an accident waiting to happen. Fortunately, we only caught one of them just by the butterfly bridge but even so, Steve was working overtime to avoid them as they zigzagged along the course. I do feel for the fastest fours who must have had to negotiate their way between them. Would it be possible/desirable to insist on a minimum age for coxes for junior boats to give some degree of control? Also, is it worth starting these boats at the back of the division, to remove any chance of interfering with faster adult crews following them? As ever, the results were through in amazingly quick time and can be found here. Another Head Race, another four wins for the club. The ladies continued their impressive run of form, taking wins at IM3 and Masters C coxed fours, with us “Masters” chipping in with two wins, one for Pierre-Yves and Tim at “B” and the other for the Quad at “C”. Only two boats in this category, with our ladies falling to St. Neots by just four seconds. As this is really a Masters C crew, a very impressive, solid performance by Charlene, Paula, Lou and Karen, with impeccable coxing (by yours truly). St. Neots ate into us off the start and although we held them through the middle of the race and put in a really strong last 500, were unable to get this back. Maybe a lesson that we need to push harder and faster off the start, as the strength was really there at the end. Pierre-Yves and Tim out again, looking more impressive each time. They powered through this race and won deservedly. Benn and Gwen reprising their multi-national crew again but not quite as successfully as last time out. Another new line up, this time with Liz, Sam, Helen J and Ash, coxed by Charlene. Showing the flexibility and depth of the women’s squad, this boat powered through to win by over 30 seconds from three other crews. Moving on from our performance last week on the Tideway, we put out probably our best row to date. The four of us (me, Simon, Tim and Pierre-Yves) put in a very fast start (rating around 35) to put distance between us and Boston (our only competition, who were following us) and then a couple of really good, strong pushes, especially past Bedford RC, saw us ease away to win by 34 seconds. Benn swapped out for Rob M compared to the IM3 boat. To his mortification, the Novice boat then went and posted a time 8 seconds faster; this seems to have been a case of lowering the rate allowed the novice men to put more power down. As my sole aims in this race were to finish the same way up as I’d started and avoid hitting anything large and immovable (memories of my last attempt at steering Bedford can be seen here), posting a time of 9:25 wasn’t all that bad. Spending most of my race looking round for the bridges probably slowed me a lot, but that’s the first one over and done with. Third out of three, 35 seconds adrift, but at least I kept dry! First time we’ve attended Star Head and it may well be the last. The marshals seem to have taken up the bad temper and rudeness that was absent from the Tideway last week and made it a thoroughly unpleasant event. We were subjected to a stream of aggressive, unwarranted (and frequently contradictory) shouting from marshals who seemed 1) to have it in for MK in particular and 2) allow Star Club crews to do whatever they wanted. Not nice. We weren’t alone in this view, having chatted to a coach from another nearby club and the one friendly marshal (who came from Bedford RC). There was a total lack of communication between marshals, leading to one great occasion when one marshal told us to spin, followed by another screaming at us “Milton Keynes, what do you think you are doing!”. Another, when we are spinning quickly at the finish area, with boats either side, to have some muppet shout at us to hurry up. The start marshal – “get your bow in” – “why are you letting your stern out?” (law of physics?) – while a Star boat sits slap bang in the middle of the river – we were not happy. The best was being shouted at to get our boat out of the centre of the river – seconds after passing the finish line, with no one coming down the river. Being shouted at to get our boat out when Star crews were sitting at the pontoon adjusting feet, swapping blades and, unbelievably, pinning numbers on was just ridiculous. It spoilt what should have been a really nice event – contrast this to the recent Bedford event, which was slick, run on time and friendly. Why should we put up with this kind of abuse? In total contrast to the weather during the preceding week and the Pairs Head a few weeks back, the weather was really quite pleasant. Very light winds, quite mild and a little bit of sun led to what must be almost perfect conditions on the Thames. A pretty much scratch crew, including two Tideway “virgins” really exceeded expectations. The four guys (Josh, Benn, Nelson and Gwen, coxed by Amelia) posted a time of 22:16:55, putting them joint 99th with Kingston and joint 3rd in class. Their time was under a minute off of the winning IM3 boat, so a truly impressive performance. Considering that our preparations for the race were completely scuppered a couple of weeks back, when Steve re-contoured his finger between two large chunks of metal, we can be well pleased with our row. Losing Steve meant Pierre-Yves shifting from Stroke to Bow/Steering, me moving from two seat to Stroke and Tim dropping into my seat, moving us from Vet C to Vet B as a result. This in turn led to us starting as race number 2! Off the start we settled well but a couple of the other Vet B Quads powered through us. We were able to keep contact with Eton Excelsior in front of us though and closed up on them past Fulham FC before being pushed a bit wide. Despite this, we finished ahead of them on time, coming 4th (of five) in Vet B and placing 40th overall. This was a really hard row, being the closest I’ve come to throwing up after a race! Despite the forecast heavy rain at 9:00, this held off until after the race and the conditions were just as good as yesterdays. Both boats were starting well down the order, 426 for the IM1 4- and 490 for the IM2 4+, leading to a long, long wait before the race. The marshals seemed to have taken a collective “chill pill” this year though, generally being relaxed and helpful, making such a big difference. The only crews getting in the neck were those that actually deserved it – sitting at 45 degrees across the rowing up lane really isn’t clever! Nice to hear a few cheers for the boats as we went along and to see a few ex-members, thanks Ray and Simon (and anyone else we didn’t see!). Going to have to wait for one of this crew to provide their views – I was coxing the other boat and have no idea how their race went! Finished 409th overall, 10th of 12 in class. Crew of Andi, Ash, Sam and Liz. Despite a long wait, having boated in Division 7 and an early drama (getting into the boat, finding we had three stroke side and one bow side blades! ), we got off to a good, strong start, quickly making inroads into the Worcester crew in front of us. We passed them around Chiswick Eyot, having to cope with another crew trying to pass us at the same time. With Charlene setting a good, steady rate and Paula, Lou and Karen backing her up, the boat was showing good speed and some really nice pushes. Just when it started getting really tough around Fulham, we had a city of Oxford boat chase us and this proved a great spur to the girls, and a serious battle developed – quite funny as their cox called “I’m on their cox, I’m on their stroke” pause “I’m on their cox”. A great response from our ladies but CORC proved too strong in the end and did pass us – all credit to their cox though as he made a point of thanking us for the race afterwards. The usual long, long row back was made more miserable as the promised rain finally arrived and we were all pretty soggy by the time we arrived back at Civil Service. Their finishing time was 23:05.54, placing them 441st overall but a highly impressive 20th (of 30) in category. On this time (recognising the conditions appear to have been a bit quicker today), this would have placed us 2nd in Vet C 4+ had we entered yesterday! Given that most of the IM2 boats will be, shall we say, a few years less experienced, this shows what a good performance this was. Four’s Head result are here and Vet Four’s results here. No photos of mine – either rowing or coxing! What a brilliant day! Held in amazing weather for the time of year (or pretty much any time of year in this country), this was probably the most successful day’s racing for the club ever. In particular, the women’s squad simply dominated the fours racing, winning all four of the categories they entered. Steve and I backed that up with a win at Masters D and there were some very promising new combinations form some of the other guys. 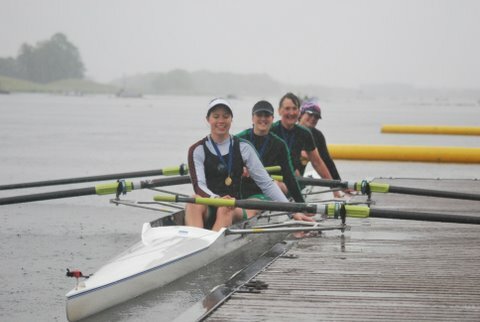 The women entered five fours in all, and these all posted the fastest times in their categories with the sole exception of the second IM2 boat, who were beaten only by the first boat, by a measly two seconds. A first outing for the IM1 coxless boat saw them win over Guildford by over a minute (the latter crew getting a very close look at the greenery by the school’s boat house). A first event for a completely new crew saw them well on the pace. They ultimately finished fourth of five, but with just 10 seconds covering the first four boats, with Marlow winning and Guildford placing two boats ahead of us and one behind. Being the first race in a new combination of Yemin and Clare, they put in a creditable performance, finishing fifth of six, some 39 seconds behind the winning Oundle Town boat. Yet another new combination, and an inaugural event for the new(ish) boat Lady Sheelah, this men’s crew were up against stiff competition and finished last of five, 44 seconds down. Not a bad result for a first race together. This was always going to be an uphill struggle, racing against the school crews, but the Novice Men acquitted themselves very well, finishing seventh of nine. Crucially, they were the first club boat home though, beating Stratford by just one second (and a BMS school boat by two seconds!). Something of a “voyage of discovery” this for Tim and Phil, racing for the first time in a pair. That they managed to finish mid-table was a really good result, especially as Star Club were clearly focused on this, supplying five of the seven crews. Three of these led our guys home but they beat off two more plus the Guildford pair. Steve and I finally return to winning ways, seeing off the Star Club double by a fairly comfortable 31 seconds (although they did have the stronger wind later in the day). A more balanced race with better power than of late (I can tell as I was completely shattered at the end). One of the performances of the day, Gwen and Benn finished second of the three crews, losing by just three seconds. Considering they had rowed together once before and you can count on one hand the number of times Gwen has sculled, we’re expecting a lot from this pair (no pressure guys…). A really good day out, in terms of weather, wins and performances. Some really stand-out competitors today, with Gwen and Benn in the Novice Double and, especially, Sam. She’d not won anything before today and left Bedford with a very impressive haul of three pots, from the IM2, IM3 and Novice fours. It was also very nice to see some new boats racing (a women’s quad, men’s coxless) and at some very senior levels too. It’s still amusing to hear people saying with incredulity that they’ve been beaten by Milton Keynes – maybe they should take a look at today’s results! The event was, as ever, excellently run and it was very gratifying to hear crew being given time penalties for being late to the start. We’re all sitting there freezing while these crews take their time – how much of this is a deliberate tactic to try and gain an edge, as so many of the offenders came from the same (local) club? Can’t finish without mentioning the results system (again) – this is so quick and well organised, it removes the endless sitting around at the end of the day waiting for results. This entry is very much done at second hand! As you can see if you read the Peterborough entry, I was otherwise engaged over the week-end, so have to rely on comments from the girlies who were at Met. Overall, a pretty successful couple of days for the ladies, with some very good results. Two crews were out on both days. The aim of this was to give some serious race practise to the Henley crews, give some big event experience to some of the newer girls and try out a couple of new combinations. It seems to have succeeded on all three counts. The IM2 4+ crew placed fourth in their heat, putting them through to the repêchage. Here they came fifth of six (beating Kingston who were six seconds ahead of them in the heat), placing 11th of 23 crews overall. A pleasing result and a good lead in to Henley. The inexperienced IM3 4+ crew were next off, placing a creditable fourth in their heat (unfortunately not enough for them to progress to the rep) in their first taste of racing at a top event. Much more to come from this boat, I feel. Another IM3 4+ boat out, this time with a different line up (that hadn’t rowed together before). They managed fourth in their heat, behind two Uni boats and Thames RC, again a very encouraging performance given they were able to beat two other clubs crews comfortably despite a lack of practice together. The other crew was an IM1 (!) coxless four, racing not only for the first time as a 4- but also above their status. Given this, it was always going to be a big ask and they duly finished last in the straight final – but against some seriously tough opposition. Good race experience and by all accounts a strong performance. All in all, a good week-end. Results available at the Met website.